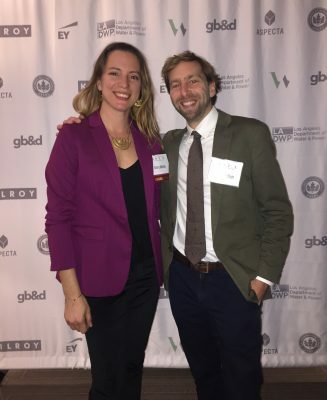 EcoRise Founder Gina LaMotte and Executive Director Jon Stott at WSLA Ceremony in Chicago. 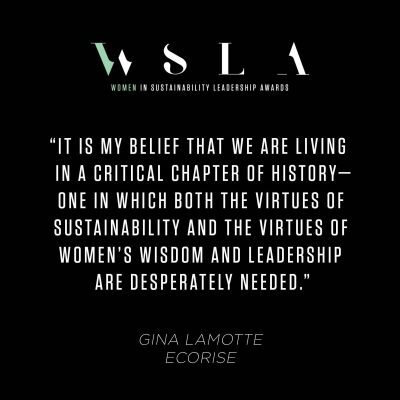 EcoRise is thrilled to announce that our fearless leader, founder, and president, Gina LaMotte, has been awarded one of Green Building & Design (gb&d)’s Women in Sustainability Leadership Awards! She received the award in Chicago alongside this year’s Greenbuild International Conference and Expo on November 13. 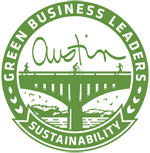 Gina and EcoRise are grateful for the opportunity to be recognized as a leader in sustainability. We would like to thank our spotlight partner Green Mountain Energy Sun Club for nominating Gina for this award. We would also like to thank spotlight partner Southwest Airlines for providing travel to and from the event. gb&d is the only magazine covering green building and design across industries. It connects and inspires green building professionals by partnering with those at the forefront of sustainable design, development, planning, and policy. SImilar to EcoRise, their mission is to empower and inspire others to create a more sustainable world. 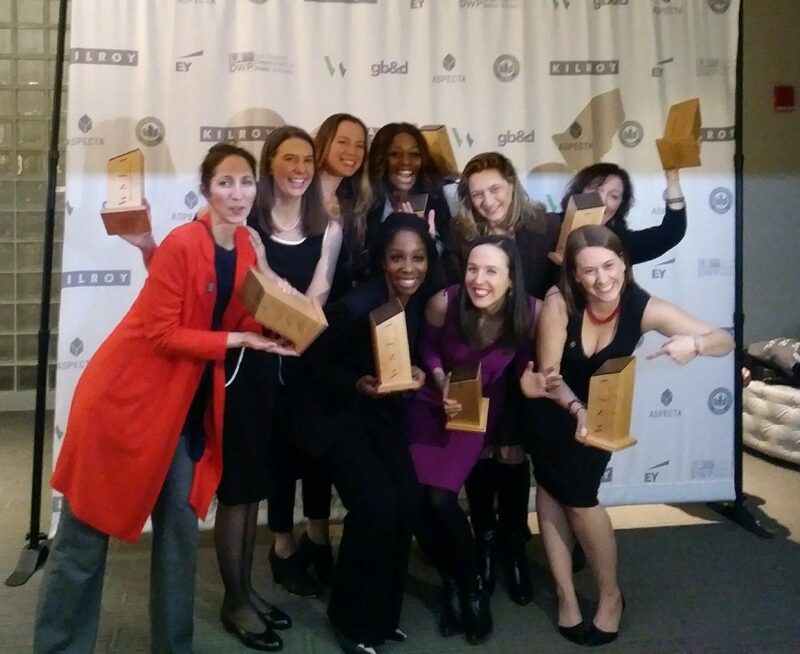 gb&d created the Women in Sustainability Leadership Awards (WSLA) to celebrate the achievements of women who are making lasting change and strives to identify, support, and give opportunities to future women in leadership. Gina LaMotte is a social entrepreneur who is passionate about unlocking the power and potential of youth as bold leaders, innovators, and visionaries. Gina founded EcoRise in 2008, bootstrapping the organization with no funding, yet dozens of community volunteers. Over the last 10 years, EcoRise has grown enormously in its impact, bringing the topics of sustainability, social entrepreneurship, biomimicry, design thinking, and green building into hundreds of classrooms around the world. Gina currently serves on the SXSWedu Advisory Board and is a former co-chair of Austin ISD’s Environmental Stewardship Advisory Committee. Gina has presented extensively at local, regional, and national conferences around the topics of green schools, design thinking, and sustainability education. She is honored to be named a WSLA winner by gb&d and is excited to continue pioneering and empowering others in the sustainability education and design-thinking realms. Read more about each of the winners here. The fifth annual WSLA is presented by Green Building & Design magazine in partnership with the U.S. Green Building Council and Halstead/MetroFlor. Winners were selected by a judging panel that includes Rochelle Routman of MetroFlor and chair of the WSLA Alumni Group, Marisa Long of the USGBC, Amanda Sturgeon of the International Living Future Institute, and Chris Howe and Laura Heidenreich of gb&d. Recipients will be honored alongside this year’s Greenbuild International Conference and Expo in Chicago on November 13.